As Salvatore from Wind Waker would say… "Splish!" In Conker's Bad Fur Day, there is a chapter towards the end of the game called War. In that chapter there is one small section in which the protagonist squirrel has to get inside a tank and storm the Tediz's base. 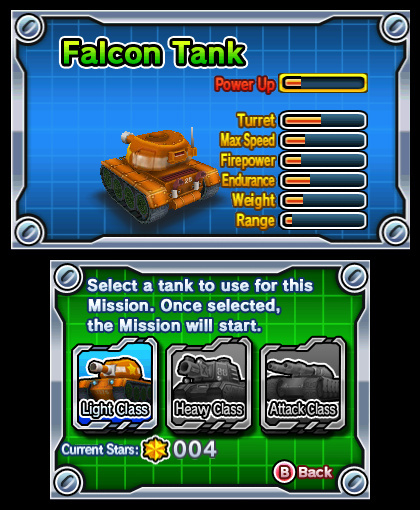 Brave Tank Hero is somewhat similar to that section of Conker's BFD, in the sense that you use tanks to storm the enemy invasion. Unfortunately that's as far as the similarities between the two titles go. That single chapter of the Nintendo 64 title, comprised of two quests and one boss fight, has more depth and is more entertaining than anything Brave Tank Hero offers in its three hour campaign. And it's quite a shame - a tank game should always be a fun experience. Sure they are slow and a bit sluggish like Ganondorf in Super Smash Bros., but they pack a punch and nothing should be able to stand in their way. The biggest crime by Brave Tank Hero is that it plays it too safe for its own good. The premise of Brave Tank Hero is simple, Paradise City has been invaded by the Shadow Tank forces and it's up to you, a low-rank soldier, to take it back from them. 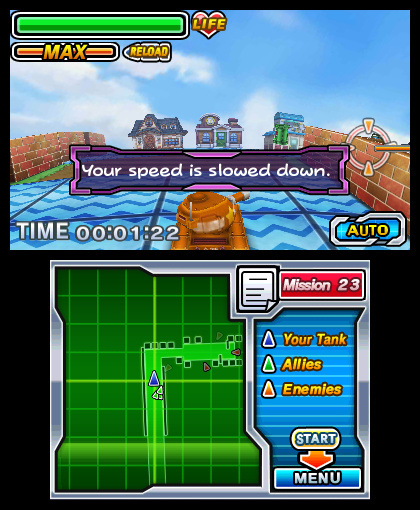 Missions start up slowly as they introduce the player to the controls, enemies and gameplay gimmicks. Controlling the tank is pretty straightforward if the controllers are set to the default layout. 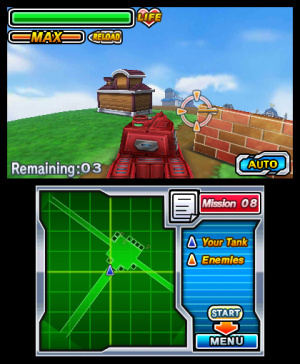 The Circle Pad controls the general movement of the tank, the shoulder buttons control the rotation of the turret, while the best part of having a tank, the cannon, is assigned to the A button. The game takes the liberty of offering an auto-lock function, leaving the player responsible for the navigation and shooting parts while the game handles the aiming; it's a fine and sound mechanic, when it works properly. 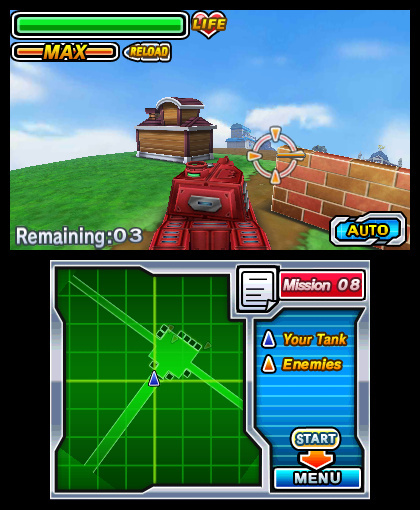 The problem with the auto-lock arises when there's more than one target in sight, as the turret will start rotating from one side to the other; this happens because the targeting system works depending on how close the target is to the player. The issue here lies in the fact that tanks are vehicles, and any vehicles' main purpose is that they are mobile objects. Luckily, the auto-lock feature can be turned off, but there's a caveat - the camera, rather than following the direction of the turret, is fixed to the back of the tank in the most claustrophobic angle possible, making it extremely difficult to pinpoint the position of the enemy tanks. There is at least one positive among this debacle, the bottom screen displays a top down view of the map giving you intel on your surroundings. 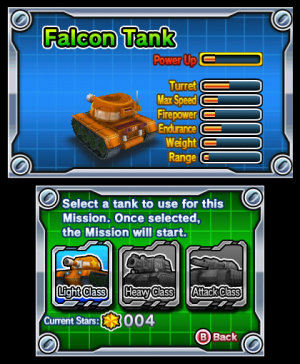 It's discrepancies like these that make Brave Tank Hero a hard sell; there are so many flaws in the basic design of the game that it is incredibly difficult to overlook them. These shortcomings are not exclusive to the controls or the gameplay; the game lacks a sense of progress throughout the 50-level campaign. Missions don't necessarily get harder, they just get longer and more frustrating due to the aforementioned flaws. There are three types of missions, but with only a few exceptions they all feel the same. It doesn't matter if you have to rescue a hostage, escape the enemy or eliminate a certain objective, the development of the events will always repeat itself - start the level, encounter the enemy, eliminate the enemy and reach the objective. Enemy tanks have no weak points and the game doesn't encourage the player to think of different approaches. It's just one mundane battle for survival after the other. At the end of each level the game awards a certain number of medals based on the player's performance, but with the exception of a few missions towards the end of the game it is never disclosed what's the criteria on how to achieve a better ranking. 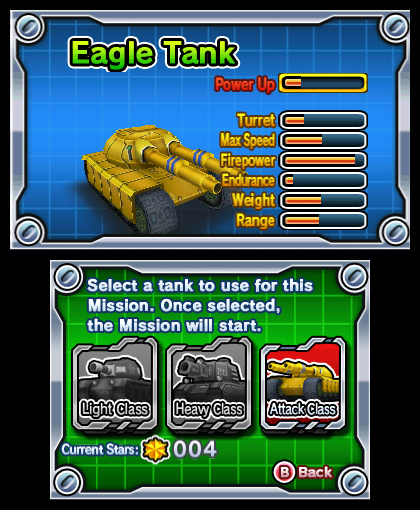 These medals can be redeemed to upgrade any of the game's three tanks. 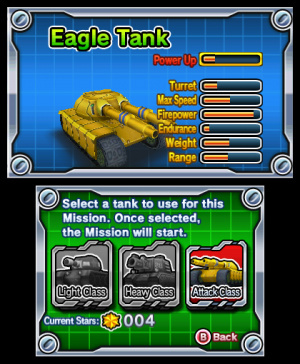 In paper each of the tanks available to the player are different - one is light and fast, the second one is a heavy tank with an impenetrable defence, and the third one comes packed with a double cannon, but is as flimsy as a cardboard box. The only departments where the game can be lauded is in the audiovisual department. 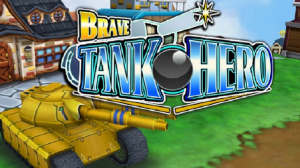 Brave Tank Hero looks pretty good, the cute graphics giving the look as if you're playing with toys. They're nothing special but manage to communicate the message. The music and sound effects are also incredibly good. 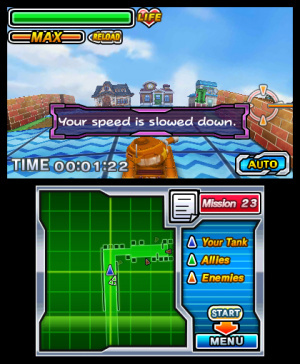 Much like the graphics, the in-game songs convey the right energy and message to the player, although there are instances where the constant 'Ka-Boom!' of the cannons drown out the music. Not that the music or the visuals could have helped Brave Tank Hero - the game just feels like a huge waste of potential and resources; not even the fact that it's a budget title should be an excuse for its sub-par quality. There is one adjective that describes Brave Tank Hero perfectly: mediocre. Even when over-viewing the flaws of the game, there are not enough redeeming qualities to make it a worthwhile experience; there is no replay value, not even local multiplayer. A game that features tanks should be an entertaining experience, especially if the game was developed by a team who has delivered series like BlazBlue and Guilty Gear, but ultimately Brave Tank Hero is a blemish in Arc System Works' library. The game looked pretty good. It's a shame it got a bad score. Oh well, great review anyway! Why such a long review when the score says it all. I always thought it was more of a... "Splursh!" I took it a step further and called Salvatore "Mr. Splish". Anyway, sounds like this game really tanked. I'm going to still pick this up but will wait for a sale. It seems more people here (myself included) are more interested in the subheading than the actual game. More of a sploosh then a Kaboom! "Don't forget your umbrella on the way out!"